Who would have thought that robots were capable of interpreting music? The large KUKA industrial robot arms that work on assembly lines, putting together everything from cars to construction materials, are surprisingly good at translating music into physical objects. The project is called Valse Automatique, and it creates a bridge between human creativity and mechanical creation. 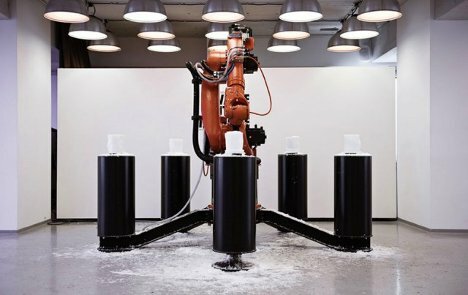 In a cooperative project between Hermann Weizenegger and a whole team of collaborators, an industrial robot was programmed to “listen” to classical music and interpret the sounds in real time. 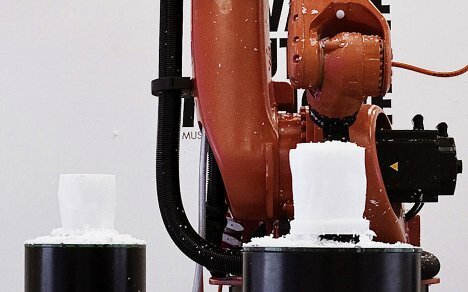 As the music plays, the robot mills chunks of wax into unique sculptures driven by the notes – it is as if the violin is giving commands to the machine. When the sculpture is done, it can be translated back into music by those who know the code. The objects of art invented by the team of collaborators through this gigantic robot are like stored music: physical translations of ephemeral notes that would ordinarily drift away almost immediately. See more in Art of Tech or under Technology. February, 2012.